A parka or anorak is a type of coat with a hood, often lined with fur or faux fur. The hood protects the face from freezing temperatures and wind. The Caribou Inuit invented this kind of garment, originally made from caribou or seal skin, for hunting and kayaking in the frigid Arctic. Some Inuit anoraks require regular coating with fish oil to retain their water resistance. The words anorak and parka have been used interchangeably, but they are somewhat different garments. Strictly speaking, an anorak is a waterproof, hooded, pull-over jacket without a front opening, and sometimes drawstrings at the waist and cuffs, and a parka is a knee-length cold-weather coat, typically stuffed with down or very warm synthetic fiber, and with a fur-lined hood. 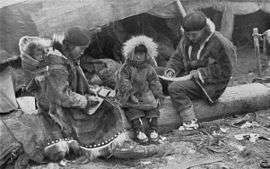 The word anorak comes from the Kalaallisut word annoraaq. It did not appear in English until 1924; an early definition is "a beaded item worn by Greenland women or brides in the 1930s". In the early 1950s it was made from nylon, but changed to poplin by 1959, when it was featured in Vogue magazine as a fashion item. In 1984, The Observer used the term to refer to the type of people who wore it and subsequently, in the United Kingdom, it is sometimes used as a mildly derogatory term. The amauti (also amaut or amautik, plural amautiit) is the parka worn by Inuit women of the eastern Canadian arctic. Up until about two years of age, the child nestles against the mother's back in the amaut, the built-in baby pouch just below the hood. The pouch is large and comfortable for the baby. The mother can bring the child from back to front for breast-feeding or for eliminatory functions without exposure to the elements. This traditional eastern Arctic Inuit parka, designed to keep the child warm and safe from frostbite, wind and cold, also helps to develop bonding between mother and child. 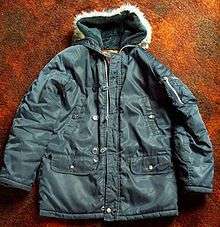 The original snorkel parka (USAF N-3B parka, which is 3/4 length and has a full, attached hood; the similar N-2B parka is waist-length and has an attached split hood) was developed in the USA during the early 1950s for military use, mainly for flight crews stationed in extremely cold areas, designed as it was for temperatures down to −60 °F (−51 °C). Originally made with a sage green DuPont flight silk nylon outer and lining it was padded with a wool blanket type material until the mid-1970s when the padding was changed to polyester wadding making the jacket both lighter and warmer. The outer shell material also was changed to a sage green cotton-nylon blend, with respective percentages 80–20, 65–35, and 50–50 being used at various times. It gained the common name of "Snorkel Parka" because the hood can be zipped right up leaving only a small tunnel (or snorkel) for the wearer to look out of. This is particularly effective in very cold, windy weather although it has the added liabilities of seriously limiting the field of vision and hearing. Earlier (Vietnam-era) hoods had genuine fur ruffs on the hoods; later versions used synthetic furs. Original manufacturers of this parka for the government included Skyline, Southern Athletic, Lancer, Greenbrier, Workroom For Designers, Alpha, and Avirex. Older nylon-shell parkas have a tendency to exhibit a change in color from the original sage green to a shade of magenta due to long-term cumulative exposure to ultraviolet light from the sun. To some in the military, this is personally desirable, as it lends to its wearer an aura of seasoned experience (referred to as salty by those in the US Navy and US Marine Corps). However, considered in a tactical environment, this is a liability, as it decreases one's ability to be camouflaged on the ground. 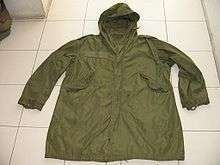 The basic N-3B parka design was copied and sold to the civilian market by many manufacturers with varying degrees of quality and faithfulness to the original government specifications. Surplus military parkas are often available for relatively low prices online and in surplus stores; they compare quite favorably with civilian extreme-cold parkas of all types due to their robust construction, designed for combat conditions, and warmth, at (usually) significantly lower prices. However, one would have to be satisfied with the single color choice of sage green. In the late 1980s the snorkel parka became unpopular and was associated with geeks and nerds, helping to create the UK term anorak for such people because trainspotters would supposedly wear anoraks whilst collecting numbers on cold railway platforms. As such it became highly unfashionable and for a time wearers became the subject of ridicule. In Europe the snorkel parka started to regain popularity in the late 1990s and early 2000s. Around 2004, the traditional association with "Anoraks" had faded and the Snorkel Parka became a mainstream fashion jacket, once more becoming particularly popular in the indie scene and with now middle-aged people recapturing memories of their school snorkel parkas. It is also once again popular as a school jacket, though at nothing like the same level of popularity as it achieved in the 1970s and 1980s. Most modern parkas more closely resemble the original 1950s design and have lost the orange quilted lining of the 1970s and 1980s school parkas, however the old school style are now considered highly desirable selling for high prices in vintage clothing shops. Snorkel jackets remain very popular within Hip Hop culture being worn by both men and women and also have an association with Indie pop. The 1970s / 1980s civilian version of the parka was made in many colours - navy blue, green, brown, black, maroon, grey, royal blue, sky blue and bright orange. Most having an orange diamond quilted nylon lining. Although a very small number did have alternative coloured linings such as yellow, pale blue and green. There were many popular brands in addition to lots of unbranded versions and each having their own unique features. For instance the Campri/Campari branded ones had the pocket flap openning the opposite way around on the hand warmer pockets. Popular brands available were Lord Anthony, Campri, Campari, Wakefields, Keynote, Skyways, Brutus, Fosters, JonJo, Crossbow, and Milletts. The fishtail parka was first used by the United States Army in 1950 to help protect soldiers from the elements in the Korean War. Following the end of the Second World War the US army recognised the need for a new cold weather system for fighting in as the existing kit was inadequate; the fishtail parka solution was the result of a concerted design effort. There are four main styles of fishtail parkas: the EX-48, M-48, M-51 and the M-65. The M stands for military, and the number is the year it was standardized. The EX-48 model was the first prototype or "experimental" precursor to all of them. The M-48 then being the first actual production model fishtail parka after the pattern being standardised on December 24, 1948. The EX-48 parka is distinctive as it has a left sleeve pocket and is made of thin poplin, only the later production M-48 parkas are made of the heavier sateen canvas type cotton. The EX-48 also has a thin fibre glass based liner that is very light and warm, the M-48 has a thicker wool pile liner with an integral hood liner made of wool. Both are distinguishable from any other type of parka by having the sleeve pocket. This was dropped for the M-51 onward The fur ruff on the hood is also fixed to the shell of an EX-48/M-48 and is of wolf, coyote or often wolverine. The M-48 parka was costly to produce and therefore only in production for around one year. The pockets were wool lined both inside and out. The cuffs had two buttons for securing tightly around a wearer's wrist. The later more mass-produced M-51 parka had just the one cuff button. The liner had a built in chest pocket which again was unique to the M-48 parka. The M-65 fishtail parka has a detachable hood and was the last revision. It features a removable quilted liner made of light nylon / polyester batting which are modern synthetic materials. The M-65 fishtail parka first came in to production in 1968. These parkas featured synthetic fur on the hoods after an outcry from the fur lobby. As a result, only hoods for these parkas made in 1972 and for one year later have real fur. A cagoule is the British English term for a lightweight, weatherproof anorak or parka, usually without the lining and sometimes coming to knee-length. A cagoule which could be rolled up into a very compact package and carried in a bag or pocket was invented by Noel Bibby of Peter Storm Ltd. in the early 1960s. It has an integral hood, elasticated or drawstring cuffs, and a few poppers or a short zip at the neck. Like the original Aleut anorak it does not open fully at the front and must be pulled on over the head. In some versions, when rolled up, the hood doubles as a bag into which the rest of the coat is pushed. It became very popular in the United Kingdom during the 1970s.